Vast choices for Perrin 08 STi GT3076R .82 A/R Rotated Turbo Kit RED at discount prices are available below. You can also browse the menu on the left for more Perrin 08 STi GT3076R .82 A/R Rotated Turbo Kit RED choices or run the search. Here at the High Performance Outlet, we pride ourselves by only selling high-quality, authentic products. Therefore, we guarantee that this product will be the respected brand name product as described and NOT a cheap, fake knockoff. We are so confident in the products we sell that we offer a 100% money-back guarantee that this is a genuine product. PERRIN Performance Rotated Turbo Kits have been a staple in the Subaru performance world since the introduction of the STI in North America. 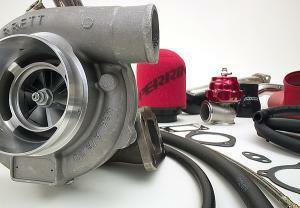 You will find the PERRIN turbo kit on many of the best built race and show cars in the world. The demand for this type of quality turbo kit for the new generation of Subaru's has lead them to introduce the PERRIN Performance Rotated Turbo Kit for the 2008+ STI and 2008+ WRX. This new generation of Rotated Turbocharger kit has all the quality and superb fitment of the older kit in a package that fits the newer cars. The kits come with PERRIN/Tial 44mm wastegate, black silicone couplers, red or black aluminum cold air intakes, fully polished 304 stainless steel up and down pipes and all the required installation hardware. They even pre-assemble the kit so all you need to do is hook up a couple oil/water lines, bolt it in and go. To get this kit running you will need a high capacity fuel pump, larger injectors, and a method of tuning the combination. So you want the most out of this kit? Look into a high flow 3" exhaust, high flow fuel rails, equal length header, Front Mount intercooler, Blow Thru boost tube, E.B.C.S., and high capacity clutch. In extreme applications you should install forged pistons. The PERRIN Rotated Turbo kits were originally designed for the customer that needed something bigger and more efficient than a stock location turbo replacement. A stock location turbo has 2 problems areas that cause inefficiencies and loss in possible overall horsepower: the intake path and placement of turbo. Both limit the size of turbo, and sacrifice intake path restrictions, again limiting potential horsepower. The PERRIN rotated kit is just that, rotated! Because they rotate the turbo to the side of the engine they can use a larger, smoother and straighter intake system. , and pretty much any size turbo you want! The PERRIN turbo kit places the turbo in the optimum position to attach to almost every aftermarket front mount intercooler. Yes, Perrin's newly revised turbo kit includes a completely new 3" cold air intake system. This new inlet hose is designed to supplied fresh cold air to your Garrett GT turbocharger. The new intake has fittings for all your crank case, valve cover breathers, and other emissions control hoses. You will see 2 very important changes to Perrin's intake system. -No MAF sensor housing = The MAF Sensor housing has been moved to Perrin's revolutionary new Blow-thru boost tube. The Blow-Thru boost tube places the MAF sensor inline between the intercooler and the throttle body. Now your ECU will receive a temperature correct reading. -No BOV recirculation fitting = For the first time you can now safely use a Vent to atmosphere blow of valve on your Subaru! Because they moved the MAF sensor to the Blow-thru boost tube just before the throttle body now vent extra boost pressure without the risk of running lean due to a loss of metered air. Any air vented from the blow off valve is now before the MAF sensor allowing the ECU to always receive a accurate reading or air entering the engine. PERRIN intake systems always include a high flow foam filter element, perfect for large turbo applications. Also included are silicone adapters, and vacuum hoses for the installation. The new 3" pipe aluminum piping look good and out performs previous intake designs. The PERRIN Rotated Kit uppipe is a TIG welded, CNC mandrel bent, 2" 304SS tube with .500" CNC cut flanges. The external waste gate is plumbed into the up-pipe with a smooth transition from the wastegate to the exhaust system allowing for smoother exhaust flow and greater control of boost levels. The up-pipe is designed to bolt to a factory exhaust manifold for those who choose to use the stock manifold. They do recommend that you consider the PERRIIN exhaust header. It is a great way to lower the spool RPM, and make more power throughout the RPM band. The down pipe is TIG welded, CNC mandrel bent, 3" 304SS tube with .500" CNC cut flanges. The PERRIN downpipe features an auxiliary dump tube to recirculate exhaust gasses from the waste gate back into the exhaust system eliminating the risk of fire and melting components from high heat associated with wastegates that just dump under the hood. The PERRIN downpipe dump tube features a floating flange design which can move and adjust to the extreme exhaust temperatures. The tight slip fit allows for expanding and contracting of the wastegate dump tube while still proving a nice tight seal. This slip fit also allows for easy quick removal of the wastegate with out having to unfasten V-band clamps, or flange connections. At its base the downpipe features a exhaust flange designed to bolt up to your OEM catback exhaust. In turn most aftermarket catback exhausts and the original stock exhaust system will bolt right up to Perrin's turbo kit. Of course any of the PERRIN Catback exhaust systems will bolt up too. 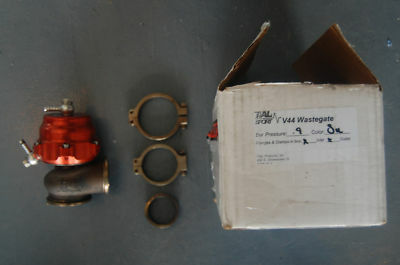 This Wastegate is a key part to controlling boost. They choose the Tial 44mm with V-band connections. V-band connections allow for a tighter more compact install of the turbo kit. 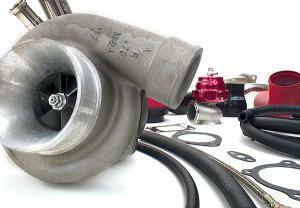 Tial is a premier brand specializing in wastegate design. Their high quality NiCrFe based alloy valves and 347SS valve housings will offer longer product life compared to competing designs. A 17-7 PH Stainless Steel actuator spring gives consistent pressure at high temperature, resisting "relaxing" at temperature to 900F (483C). The 44mm model features a larger diameter valve compared to other kits, which makes for flawless boost control. A 14psi WG spring is included with the kit but many other spring choices exist! Most PERRIN turbo kits come with two exhaust housing options. .63AR, and the .82AR. The AR in simple terms is the overall size of the housing. A larger number indicates a freer flowing housing. A larger housings flow more air, but at a lower velocity which in turn has less energy spool the turbo. Though more airflow does equal more upper end horsepower, a larger AR will increase boost lag. The smaller AR. will spool the turbo faster it will have lower horsepower on the upper end. High Performance Outlet accepts PayPal and all major credit cards with a US billing address (Visa, MasterCard, American Expres, & Discover). For security reasons, we can only accept credit cards with US or Canada billing addresses. We reserve the right to only ship to the billing address for a credit card or the shipping address provided by PayPal. If you would like to use another payment method other than what is listed, please contact us prior to purchase. Standard shipping charges are for orders that are to be shipped to non-PO Box addresses within the 48 continental states of the United States of America. For orders outside this area an adjusted shipping rate will be charged (This includes APO/AE, international, AK, PR, HI, etc). Please contact us for a shipping quote before purchasing. Most US orders will ship via USPS, UPS, or FedEx. We reserve the right to ship using a comparable or upgraded shipping service from a different shipping company with no extra charge. If a specific shipping method and service is desired, please send detailed instructions to [email protected] immediately following the purchase. Actual shipping fees are non-refundable regardless of the shipping fee charged (even if we offer free shipping). In the case of a return or exchange, the actual shipping fees will be used, NOT the ones charged. Please also note that we can only ship to the address provided by PayPal or the credit card billing address for security reasons. All returns and exchanges must be sent back with appropriate RMA documentation. High Performance Outlet, LLC is not responsible for any returns sent without proper documentation. All returns are subject to a 25% restocking fee and High Performance Outlet, LLC is not responsible for ANY shipping fees. Please note that the actual shipping fee we paid is non-refundable regardless of the shipping fee we charged.